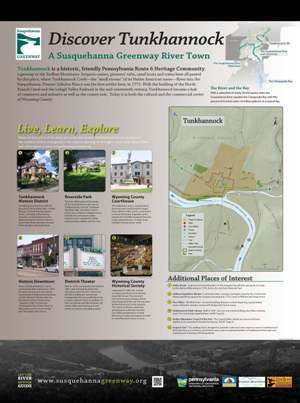 Tunkhannock is an historic, friendly Pennsylvania Route 6 Heritage Community; a gateway to the Endless Mountains. Iriquois canoes, pioneers' rafts, canal boats and trains have all passed by this place, where Tunkhannock Creek--the "small stream" of its Native American name--flows into the Susquehanna. With the building of the North Branch Canal in the early nineteenth century, Tunkhannock became a hub of commerce and industry as well as the county seat. The completion of the Lehigh Valley Railroad in 1869 enhanced that standing, and today it's both the cultural and commercial center of Wyoming County. A walking-tour brochure will tell you about the architecture--Gothic Revival, Colonial Revival, Queen Anne--of many of the homes, churches, and business in this National Register Historic District, and a little about the lives of some of the families who built them. This tree-filled park on the banks of the Susquehanna is the site of Tunkhannocks's annual "Celebrate Our River Day" and other events. It also has a children's playground, a boat launch, and picnic tables, benches and a gazebo for sitting and watching wildlife and the river. This Italianate, stucco-covered brick structure was constructed in stages from 1844 to 1992, and its clock tower is a local landmark. A gazebo and a handsome Civil War memorial face the landscaped entrance. It often hosts exhibits of local artists' work. Rows of brick storefronts, many constructed after a disastrous 1870 fire and now home to an eclectic assortment of shops and restaurants and the Dietrich Theatre, line the first blocks of East Tioga Street. "Founders Day" in June and "Christmas in Our Home Town" in December see the street closed and thronged with visitors. Built in 1936 and completely renovated in 2001, this Art Deco building is owned and managed by the non-profit Wyoming County Cultural Center. In addition to first-run movies and film festivals, the Center offers art galleries and studio art and performing arts classes. Organized in 1946, the Society occupies two floors in the former Sand Hill School. The Society's historical museum displays items illustrating local life and history, from Native Americans to the present. The research library's extensive genealogical collection includes microfilm and abstracts of early Wyoming County newspapers as well as cemetary and census records. Founded in 2005, the Endless Mountains Nature Center offers a variety of activities ranging from onsite exhibits to a 11 mile trail system that weaves through 360 acres. Visitors can look for butterflies in the native plant gardens and view various birds of prey. In addition, the Center offers several educational programs throughout the year.